James was 5 foot 3 1/2 inches tall, 125lb, had a chest measurement between 31 and 34 inches. He had a medium complexion, with blue eyes and brown hair. South Canterbury. James Mann Collett Howard was born on 18 December 1887, the son of Henry Rogers Howard and Elizabeth Hannah Howard, of 50 Lindsay Street, Christchurch. James married Ina Myrtle Pierce on 2 November 1915 in Geraldine. At the time of his enlistment on 28 March 1917, James described himself as being married self employed coach painter of Geraldine. His medical exam described him as being Anglican, 5 feet 3 ½ inches tall, 125lb, with a chest measurement of 31 inches. He was of medium complexion with blue eyes and brown hair. After his initial training he was posted to B Company, 28th Reinforcements 3rd New Zealand Rifle Brigade of the 3rd Battalion. Private Howard (serial no. 52610) left Wellington on the 14 July 1917 on board HMNZT 89 Waitemata. They landed at Plymouth, England on the 24 September 1917, before marching into Sling Camp for a month’s training. After being attached to a unit in Irdworth, he left for France on 11 January 1918 arriving at Etaples on 13 January 1918. He was attached to another unit at Abule for a time before joining the Battalion. There he was posted to D Company on 5 April 1918 which was on the front line. James was killed in action while fighting in France on 21 April 1918. 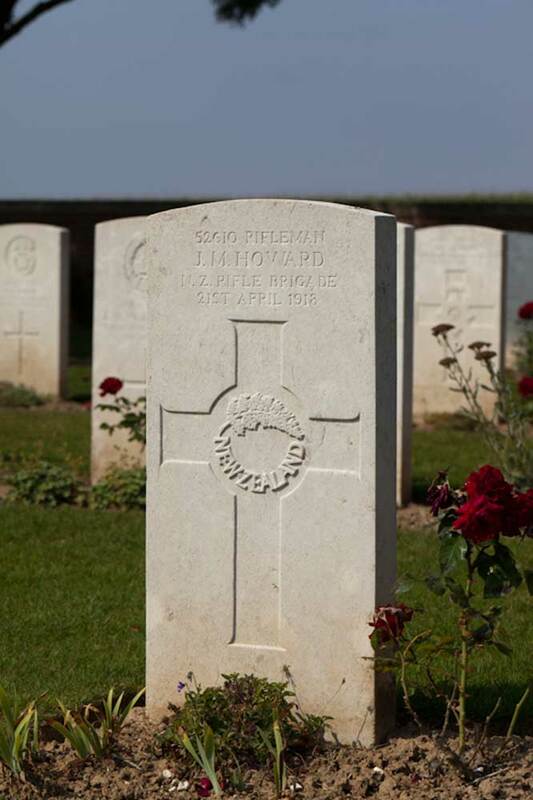 James was originally buried at Beausand Community Cemetery before being exhumed and reinterred at Englebelner Communal Cemetery at Somme, Picardie, France. James’ brother John was also killed during the war.